Why are my business’s Yelp reviews not being displayed? Why are my customer’s Yelp reviews not recommended? Why are my customer’s Yelp reviews filtered? I recently sold a company that had a storefront and I have been on the receiving end of Yelp’s reviews. These days I am a Yelp reviewer, and have earned “Yelp Elite” status. I now help businesses with local search. Even with all of this experience it took some research to thoroughly wrap my head around Yelp. Now that I understand what is going on with Yelp I thought I would share. The complaints are rampant. Some business owners boycott Yelp. The problem is that not all user reviews display. A very successful real estate agent that I have been observing online started getting Yelp reviews recently. She sells homes that are, on average, priced around $500,000. I personally know for a fact that she is not manipulating the Yelp system. Clients of hers contacted her asking her how to leave her a review and/or found her Yelp page naturally. Of the last 10 people who wrote her a review on Yelp, only 3 displayed. 3! That is five million dollars worth of transactions and only 30% of her reviews are showing up. In other cases, 100% of a business’s reviews display. I’ll explain why in a moment. There are hundreds if not thousands of people online complaining about their Yelp reviews not showing up. 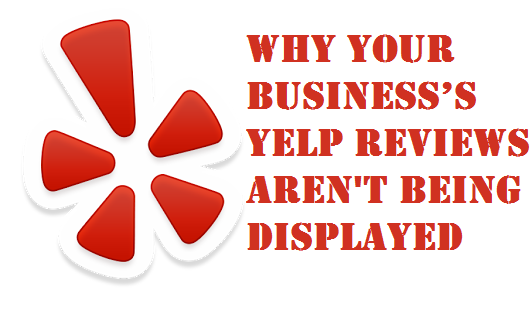 Many people assume and state as a fact that their reviews will not display unless they pay Yelp a monthly fee. People have filed class action lawsuits against Yelp claiming extortion. While this appears to be the simplest answer I find it hard to believe (but not impossible) that a publicly traded company would intentionally extort businesses. After all, there are over 18 million companies in the United States. On January 6, 2015, Yelp announced that the FTC has closed their investigation into Yelp and after looking at Yelp’s recommendation software (algorithm) and concluded that Yelp is not extorting business owners. Why aren’t my Yelp reviews displaying? User reviews are filtered depending on how many reviews reviewers have left. A user’s first review is extremely unlikely to display. A user’s second review has about a 20% chance of displaying. 3rd review, 25%. In addition, this data is used in conjunction with filtered star ratings, for example, 4 star ratings are more likely to be published than 5 star ratings. This information comes from section 3.4 of this in depth study which shows how Yelp’s algorithm works. It is a very comprehensive study, if you wish to know more, take the rest of the day off and read it. Yelp reviews can also come and go, or fall into the “recommended” or “not recommended” category. This leads to people asking “Why are my Yelp reviews disappearing?” Well, another factor appears to be the reviewer’s activity. To say that some business owners hate Yelp is putting it politely. Of course, business owners want their good reviews to display. Google shows them, why wouldn’t Yelp? If you take a look at reviews on Google My Business, you will see that a very large portion of people have left 1 review. This usually happens after they have had a very good or bad experience. And, from my foggy mental notes, it seems that these one hit wonders are most likely to leave a 1 star or a 5 star review after they have had a terrible or a great experience. Yelp ranks well in Google search and now Yahoo displays Yelp’s reviews. Also, an increasing number of people use Yelp and search from Yelp. I personally use it all the time and am very happy with the Yelp app. If you have never used it I would highly recommend you download it and install it on your phone. Open the app up and type in “coffee” to see the nearest coffee shop and also check out the “monocle” feature- it is cool. You can add friends and see each others check-ins. Check in enough to a biz and become the “Duke”. Other users can vote on your reviews or label them “cool” or “funny”. You can earn badges, too. It really has made reviewing fun (for some people). Yelp states that the filter is in place to prevent business owners from giving themselves fake positive reviews. Unfortunately, on the Internet nearly anything can be manipulated easily, and creating a Yelp account is as simple as verifying an email address. Despite the filter, this leaves Yelp completely vulnerable. However, people looking to accomplish things the quick and easy way (eg: via fake reviews) will likely discouraged by their reviews not displaying and too lazy to discover why and just give up. Yelp isn’t going away anytime soon; if you are in business you need to figure out how to turn problems into opportunities. Yelp is also just one of the many avenues to ranking your business in search. I have had people write reviews who are active with yelp when it comes to rating and commenting on other businesses and yet it is listed as not recommended. I have one review.. who gave me a 1 star rating.. who is actually a employee who I had to let go for stealing and the list goes on.. and this person wrote in as another customer who she dealt with during that short time at my store.. She is pretending to be that customer.. She has been fired from all my competitors.. I was warned not to hire her.. I wanted to still give her a chance and am now very upset that I did not listen. Things that were said in the last reply from her that gave her away…as well as people have called, saying that this person is writing false reviews.. How would they know this? I never told anyone.. The information that is written is completely false.. a lie.. a fabrication and an employee who was let go for many reasons.. I need help.. I reported it.. but do not know what else to do. My store is within a small community and this is really hurting my business.. Also, there are reviews that are not recommended that are also false going back to 2013 but i can not report it.. or reply to the review. How do I fix this? Thank you for the insightful information on Yelp reviews. Disappointing is the best word to sum up this answer. Many people are not regular Yelp reviewers, or reviewers of anything for that matter, so for their opinion to basically not matter, unless they regularly review online or through Yelp, is terrible. Terrible policy regardless of Yelp’s corporate worries about business’ rating themselves.